I went to Harajuku. Do you like Harajuku? Harajuku is one of the most trending places in Japan. You can see a modern Tokyo here. If you visit Harajuku, you will be at the forefront of trends followed by youngsters across Japan. Many tourist and celebrities come to visit to Harajuku. 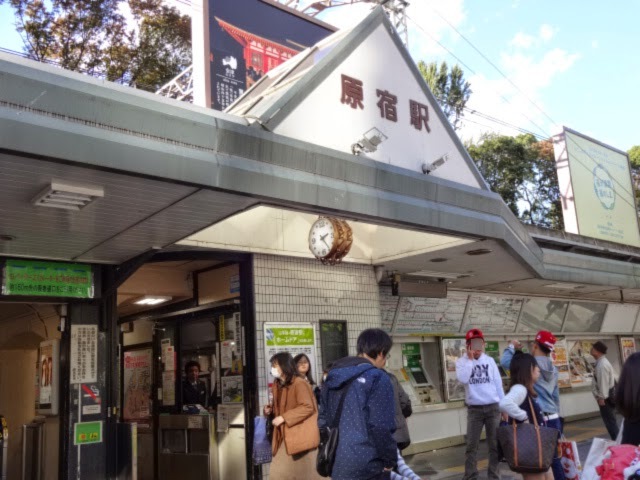 Here is the Takeshita entrance gate of Harajuku station. Many teenagers love to go to Takeshita street. Many shops are lined along the street. You can find Japanese teenage culture here. I often go there when I was a school girl. Many teenagers and tourists are walking the street. Some cloth shops. You can buy Pikacyu T-shirts and Kanji character printed T-shirts. DAISO is a large franchise of 100 yen shops in Japan. Even DAISO in Hrajuku is so KAWAII (cute). Have you ever eaten crepe? If you go to Harajuku, I recommend you should have crepe. Here is the Santa Monica Crepe. They have more then 40 favors of crepe. Check their homepage blow. Which favor do you like the best? I like banana and chocolate with custard cream the best. Teenagers loves Takashita street, but also grown-ups like Harajuku. There are many nice restaurants and cafes. The price is not so expensive. Harajuku gives us a lot of energy.